Many NLM readers will be familiar with the name of David Fagerberg, who has significantly enriched contemporary discussions of liturgy. I am pleased to be able to announce the recent appearance of not one but two new books by him. I've read Consecrating the World and my positive opinion of it is indicated in the blurb below, courtesy of the publisher's (Angelico Press) website. WHAT HAS LITURGY TO DO WITH LIFE? The sacred with the secular? 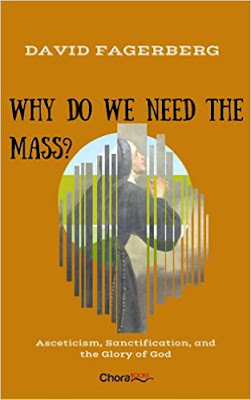 This study proposes that the liturgy calls us, in the words of Aidan Kavanagh, “to do the world as the world was meant to be done.” The sacramental liturgy of the Church and the personal liturgy of our lives should be as a seamless garment. 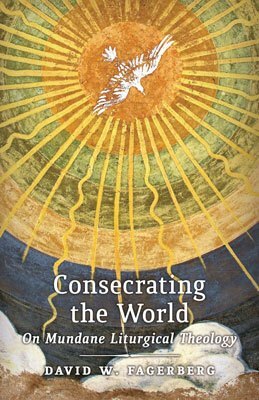 Consecrating the World continues David Fagerberg’s exploration of the Church’s lex orandi (law of prayer) by expanding two major themes. The first considers liturgy as the matrix wherein our encounter with God becomes an experience of primary theology. The second illustrates how a believer is made ready for this liturgy through asceticism in both its faces — the one negative (dealing with sin), the other positive (dealing with sanctification). This book turns these two themes outward to a liturgical theology of the cosmos — a mundane liturgical theology of the consecration of the world and the sanctification of our daily life. Liturgy in recent years has returned to the center of the attention, thanks to the Pontificate of Benedict XVI. This is why it is always relevant to witness the release of a new book from Professor David W. Fagerberg, a world famous expert in this topic. This is an important short book for the Catholic understanding of the Mass and of the role of the liturgy in today's world. . . .
"Liturgy refers man to God, and God to man, even if we cannot know God in his full mystery": liturgy is the limen that allows us to look at a dimension that is beyond our understanding but that at the same time was made present thanks to God's incarnation. But we should avoid thinking that "humanizing" the liturgy will do us good: "We serve the glory of God, the glory of God does not serve us". Being reminded of this is very important, because we need to put always in the right hierarchical order the relationship we have with God. Several themes are touched in this book, as teleology, asceticism, ecstasy, and so on. When talking about asceticism this is what Professor Fagerberg has to say: "I propose that liturgical glorification of God is a daughter born of asceticism. We need to undergo the ascetical technology of self, and make our wills conform to God’s, before we can worship and glorify him properly. Each person is a block of marble within which lies an image of the image of God (Jesus), and each strike of mallet and chisel by the Holy Spirit frees that image from stone-cold vices in order to create out of women and men a liturgical son who shares the Son’s filial relationship with God the Father. At the end of asceticism is dispassion, which has a child called love, who opens the door to the cosmos as theophany, and invites us to a union with God that is true theology. Purity of heart is to will one thing – we hear this from Evagrius in the desert, from Augustine in the ancient Church, from Petrarch in the medieval Church, and more recently from Kierkegaard. If we are to do the world the way the world was meant to be done, then the Holy Spirit will have to craft our hearts until we only desire one thing, too. The pure in heart are blessed because they shall see God (Matthew 5). The purpose of liturgy is to glorify God, but our ability to do so comes at a price: it is born of asceticism."